Hammersmith and Fulham’s Garden Waste Collection Service has been brought to an embarrassing end after H&F Conservatives announced it will amongst the latest round of cuts to services last Wednesday night. The Garden Waste Collection Service became shambolic after H&F Conservatives won the 2006 local elections and introduced a new £6.25 charge for the scheme as part of their stealth tax initiative. Prior to that, charges for garden waste were included in the Council Tax payment and the scheme covered the whole borough. By the end of that year H&F Council admitted that the scheme was embroiled in confusion when the refuse collectors proved incapable of recognising who had paid and who hadn’t - leaving garden waste bags scattered or uncollected across Hammersmith, Fulham and Shepherds Bush. Thousands of residents ceased to use the scheme. H&F Conservatives then put the prices up to £7.50 and complaints kept pouring in. Then last year, the Conservatives said they would review the scheme but instead started to consult on a new £25 charge. The public outcry continued and in a surprise move, at last Wednesday night’s Council meeting, the Tories attached a last-minute amendment to another Council Motion which admitted they were going to give up trying to provide any sort of garden waste collection service. Many residents are asking what are they now expected to do with their organic garden rubbish? 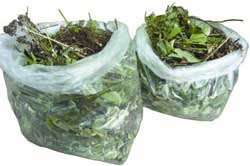 The Council’s communal composting is also suspended meaning that the grass cuttings, branches and other material will now either be put out with other household waste and taken to landfill sites or go uncollected. Sources confirm that the borough’s Conservative Councillors are considering £100 fines for residents who put their garden waste into normal household rubbish. Many people will simply dump their garden rubbish onto the streets out of frustration or as an act of civil disobedience - making our streets even filthier. Expect to read more about this as the Council encounters extra landfill taxes and falls even further behind on its recycling rates. Please email me here if you experience problems following this latest cut to the service and need my help. But David Cameron told us all to "Vote Blue, Go Green" during the last Council election. Is he turning a blind eye to this as well as everything else Hammersmith and Fulham's Conservatives get up to? The tory council proudly announce that they are cutting council tax for 2009 - the only council in the UK to do so - and it's no surprise that they are therefore cutting services. In the survey they conducted, they claim that nobody wanted to continue the garden recycling - even though 42% of the survey did! The "vote" to continue the scheme was defeated, apparently, by a staggering 12 votes. Let's hope the next tory government doesn't decide policy on such margins. This whole issue goes against Cameron's green agenda as well as public apetite for environmentalism. Shame on the tories for doing this. But I do not think it is right for you to accuse them of introducing stealth taxes - the Labour government is by far the worst culprit for this.